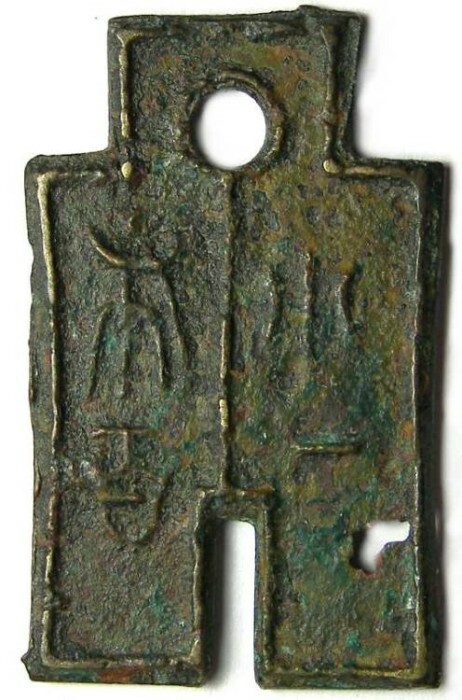 Denomination : Bronze value 100 spade. Date : Wang Mang ruled between the two Han Dynasties from AD 7 to 23. This type was introduced during his 3rd coinage reform of AD 10 and was a very short lived issue (probably less than 1 year). Size : 20.3 x 33.3 mm. Weight : 5.45 grams. Grade : VF, slightly rough, with a significant corrosion hole on the right leg. Obverse : "HSIAO-PU YI-PAI " meaning "SMALL SPADE, ONE HUNDRED". With the exception of the value 1000 spades, all of spades in this value 100 to 1000 series of this 3rd coinage reform are rare, and genuine examples seldom seen in any grade.